Stonewoods are a leading independent fireplace and stove specialist retailer. We pride ourselves on our ability to offer a wide range of high quality products from around the globe. Below is a list of some of the affiliated brands and partners that we offer. Element 4 – Since 2006 Element4 has developed into a widely recognised and respected designer and producer of gas fires in Europe, based on the principles of innovation and design simplicity. Element supplies a highly valid network of dealers that guarantee end users expert advice and optimum service. Gazco - An outstanding range of stoves, fires and fireplaces. Gazco manufacture gas and electric stoves, fires and fireplaces. The Gazco Group is the UK's largest stove and fireplace producer with a range of designs from contemporary to traditional to suit everyone's requirements. Faber - The brand Faber is a part of Glen Dimplex Benelux and amongst others a manufacturer of gas, electric and wood stoves. Stovax – An outstanding range of stoves, fires and fireplaces. Stovax manufacture wood burning, multi-fuel stoves, fires and fireplaces. The Stovax Group is the UK's largest stove and fireplace producer with a range of designs from contemporary to traditional to suit everyone's requirements. Capital Fireplaces – Contemporary Fireplaces, Marble Fireplaces, Woodburning Stoves and Stone Fireplaces. Capital Fireplaces' has been established for over 20 years, and is one of the UK's leading trade suppliers of Fireplaces, Fires and Stoves including stone fireplaces, marble and cast iron fireplaces. Warm Home - The largest range of contemporary and period fireplaces, fire baskets and wood burning stoves. Our comprehensive fireplace products range combines the best in leading edge design with timeless classic. We pride ourselves in the breadth and variety of our fireplace products which suit all tastes and budgets. Vision Fires - One of the most innovative aspects of all Vision Trimline fires that there is no need for an existing chimney to be present. This is all down to the clever features of our balanced flue system. A balanced flue gas fire is fully room sealed. Not only does this make for a highly efficient and safe appliance, but when combined with our concentric flue components, our fires can be positioned in virtually any part of your home with relatively simple 'chimney column' built around it. Mansion Fireplaces - Mansion Fireplaces presents an exciting collection of both traditional and contemporary fireplaces. Mansion Fireplaces offers an extensive range of stone and marble mantles, cast iron inserts, steel hob grates, free standing grates and timber surrounds. Arada - With stoves to suit every lifestyle and setting, we make it easy to put a warm glow at the heart of your home. We have freestanding designs that are just right in an inglenook fireplace. If you’re looking to fill an empty hearth, our inset stoves are sized to slot straight into a traditional British fireplace. Or go for modern minimalism with a cassette model. Fireline - The Fireline range offers a wide variety of multi-fuel stoves. Key features include a 5mm and 10mm thick laser profiled and seam-welded steel construction for strength and long life, draught-controlled tertiary air systems, plus many more unique benefits. All freestanding models fitted also come with solid fuel burning kits as standard. Infinity Fires - British designed and made for the British market, Infinity Gas Fires have the appearance of Continental fires although they are designed to work in UK households. Infinity also offer a range of electric suites. Abbey Fireplaces - At Abbey Fireplaces we have over 25 years experience in the industry, manufacturing and providing the finest quality reproduction fireplaces to the UK. We manufacture an extensive range of period and contemporary fireplace surrounds in marble and limestone, all hand carved to the highest standards from purely natural materials. We also manufacture a wide range of cast-iron interiors and fire-baskets, all authentic copies of originals. Yeoman - Yeoman is one of the UK's leading stove manufacturers. From its humble origins over 25 years ago on a farm near Dartmoor, renowned for its cold winters, Yeoman has grown to become one of the UK's leading stove manufacturers. Today, we offer a wide selection of traditional and contemporary wood burning stoves, multi fuel stoves, gas stoves, electric stoves and high-output boiler stoves. Dovre - Built to last Scandinavian winters, you can rely on premium quality, cast iron Dovre fireplaces, stoves and accessories. Dovre's stoves and fireplaces are built to endure the harshest of Arctic winters. In fact, Dovre's manufacturing expertise with premium grade cast iron is such that all cast parts on their stoves and fireplaces come with a 5 year guarantee. With expertly crafted wood burning and multi-fuel fires and stoves as well as highly convenient gas and electric models, there is a Dovre for every home. Brosley - Our range of products include cast iron stoves, boiler stoves and Defra approved products for smoke control areas. Many models in the Broseley Fires range are available in multifuel,wood burning, electric and gas fuel versions. Lotus - Lotus Wood Burning Stoves and Fires. The Lotus range of wood burning stoves and fires has been created in close cooperation between Architect Kaare Solvsten, technicians and suppliers from all over the world. We combine Danish design traditions with the best quality comonents. Our outlook is international and we always strive to create simple, beautiful products, grounded in tradition yet combinging the best design, functionality and technology. Exodraft – Exodraft is a Danish owned company that has for over 50 years developed, manufactured and sold chimney fans to control chimney draught. With sales in more than 40 countries and the best product range on the market, exodraft is the world leader in solutions for mechanical chimney draught and heat recovery from flue gas/process heat. Our products are built on a comprehensive understanding of the relationship between combustion and chimney draught, and we solve problems with insufficient chimney draught for households and businesses alike. Icon Fire - Icon Fires produces a stunning and exclusive range of Bio Ethanol Fireplaces and accessories to create you own ICONIC fireplace. Expanding on its development of Bio Ethanol Fireplaces, Icon Fires now offer a range of high quality bespoke linear burners, wall mounted fireplaces, inbuilt fireboxes and accessories for the residential and commercial markets. Eco Smart - The EcoSmart Fire collection of ethanol fireplaces is incredibly versatile and gives you absolute design flexibility to create exactly what you want, without any hassles or restrictions. EcoSmart Fire offers a complete collection of versatile and award-winning fireplace solutions that make having an open flame incredibly easy - whatever the setting - at the same time as being good for the environment. English Chimney Pieces - Are an expert fireplace company whose aim is to supply high quality products through our trade partners. We have a wide range of traditional and contemporary products an examples can be found in our specialist retail partners showroom. We only use natural materials quarried in Europe and Asia which are manufactured to a very high standard. Carron - We are proud to bring you a quite stunning collection of superior cast iron fireplaces and surrounds, with styles and designs to match all décor and embellish homes for many a year to come. Carron’s Fireplaces and surrounds are all manufactured to the highest standard using quality casts, and assured manufacturing techniques. We spend a great deal of time ensuring the highest standard of finish is applied to our cast iron fireplaces using high quality Liberon Iron Paste. We offer a superb range of cast iron wood burning stoves and log stores. Robust and greatly dependable along with styling and performance to meet the heating needs and requirements of any home. A Carron cast iron stove is a sign of quality, manufactured to the highest production standards and built to last. Featuring a large flame picture window for an inviting and a comforting glow. Burley - Warm yourself this winter with a Burley. The worlds most efficient wood burning stoves, flued gas fires and 100% efficient flueless gas fires. Legend Fires – Legend fires was established in 1996 and have become one of the leading names in the development and manufacture of living flame gas appliances. Awarded 'Manufacture of the Year' in 2004 and 2005. Legend has a unrivalled manufacturing and service reputation in the gas appliance industry. Ethos – Breaking the rules of the game with the industry leading performance, the Ethos promises to define an era by being more admired than anything else around. Rich and understatedly opulent, with a rakishly sophisticated exterior, the Ethos is designed to be noticed and built to last. And in true Legend Fires tradition, the new Ethos range has once again raised the bar for efficiency, performance and style. Stuv - Our wood-burning stoves are designed for floor- or wall-mounting. They do not need to be built into a partition. Stûv stoves are available in many formats and sizes, with sizes which vary according to the heat output; they are designed to deliver their maximum output when running in closed mode, while still allowing the heat output to be adjusted. Nu Flame - For over 25 years Nu-Flame has bought together the widest range of both open fronted and glass fronted fires, combining the very best of British Innovation, Design and Engineering. With Nu-Flame you are guaranteed Quality, Realism and Efficiency; let us help you turn your house into a home. Purevision - The Purevision™ HD range comprises six models, three freestanding and three inset with stand and log store options available for the freestanding versions and three or four sided trims for the insets. There are a range of Purevision stoves, which are designed for the differing tastes and preferences of our customers. FDC - Established in 1997, FDC (UK) Ltd has grown to become one of the leading trade distributors of fireplaces and related products in the South of England. Based near Salisbury, we hold comprehensive stocks of our entire product range within 20,000 ft of warehousing. Nordpeis - Nordpeis Wood Burning Stoves and Fires. The Nordpeis range of wood burning stoves and fires are the culmination of over 20 years of industry knowledge to bring you the finest in home heating. We offer a diverse range of wood burning stoves and wood burning fires featuring both traditional and contemporary styles to perfectly complement your home. Varde - Varde Ovne Stoves are stylish, created to unite quality, function and Scandinavian design. With a Varde Ovne stove, your home has a warm and elegant focal point for years to come. The stove is easy to use and you get the most out of your wood fuel. Villager -Our wood and solid fuel burning stoves feature market leading technologies and epitomise traditional design. Stratford - Our wood and solid fuel burning boiler stoves feature market leading technologies. Thoughtfully designed and easy to use, they'll provide dependable heat. Hamlet – Nothing is more evocative than curling up snug and warm in front of your Hamlet stove on a cold winter's evening. We carefully design and lovingly build each stove at our state of the art workshop nestled in the heart of the Devon countryside.Our devotion to quality touches every aspect of its creation. This allows us to offer an impressive 10 year guarantee on the stove body for all Hamlet dry stoves (terms and conditions apply). Aarrow - Our wood and solid fuel burning stoves feature market leading technologies. Thoughtfully designed for contemporary energy-conscious living. Jydepejsen – Jydepejsen has designed, developed and manufactured wood-burning stoves for 36 years. Jydepejsen offers 12 different wood-burning stoves, all of which are available in different sizes and variants that is just right for your home. Magiglo - The Magiglo brand is produced by Burley, one of the UK's leading manufacturers of gas fires and electric fires. Over the years Magiglo has built a solid reputation for designing and manufacturing quality fires with the emphasis on both realism and reliability. Magiglo constantly strives for greater efficiency, to reduce energy costs and carbon footprint. The Magiglo Empathy flueless is one of the most efficient gas fires in the world: it is 100% efficient so of course it cannot be surpassed. The Tribute is a highly efficient balanced flue fire which boasts 83% efficiency. J.C Bordelet - In 1976, the designer JC Bordelet specialized in the study and the manufacturing of design fireplaces. Very quickly he found its place at the avant-garde of fireplace creation by integrating colors and mastering perfectly the metal techniques. Since then, the philosophy has not changed: seriousness, innovation, know-how and reliability are its leitmotivs, which have allowed the designer to become an irrefutable reference. By joining the Seguin Group in 2006, which shares similar values, the company JC Bordelet expanded its network with a renowned expertise, making the choice to place its creations within everyone’s reach. Evonic Fires - In 2012, they had launched a range of electric suites, enhancing our portfolio which includes inset and wall mounted fires and a stove. They use the latest technologies in 3D LED designs which produce a beautiful flame effect for just £1.00 per year based on 5 hours usage per day. Poujoulat - A complete chimney solution for all applications & fuels. Established in 1950, The Poujoulat is Europe's number 1 in metal chimney systems. Poujoulat has an immense wealth of knowledge of chimneys and the requirements of the appliances they serve, covering diameters from 50mm to 3m, suitable for industrial, commercial and domestic markets. 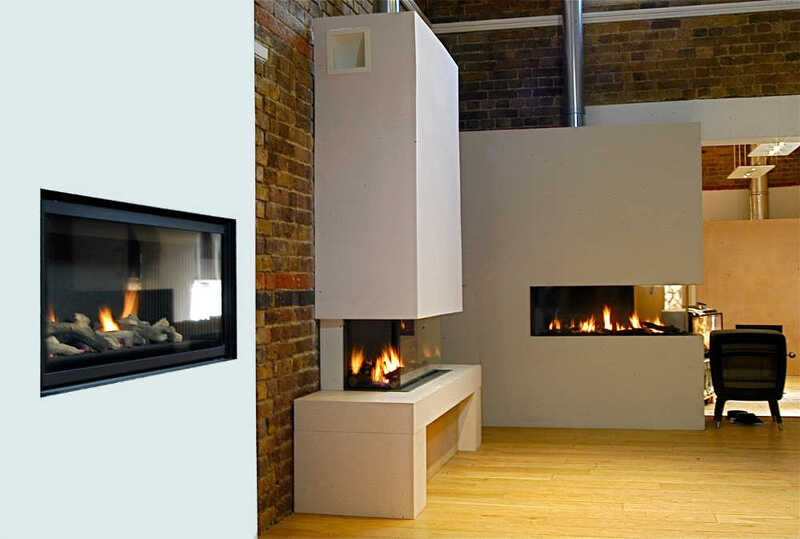 Cocoon - COCOON FIRES produces a stunning range of fireplaces and products that are as functional as they are beautiful. Designed by innovative and celebrated designer Federico Otero, the Cocoon is an example of contemporary design made unique. Running on biofuel, our fireplaces are clean and evironmentally friendly as the flame radiates warmth throughout the room. Our pieces will make great stylish additions to interior and exterior spaces. Our ethanol based fireplaces are smoke free and require no flue. They represent not merley decoration but real fireplaces which create an outstanding environment. Real Fyre - For more than 65 years Real Fyre has been creating the most beautiful gas fire products you can buy. We build gas fire logs so authentic looking, they're equally beautiful with or without a fire burning. And those seeking a more contemporary look, Real Fyre also offers a wide range of stunning glass and stone designs. Kensal - Kensal has been providing a comforting glow to homes throughout Britain and Ireland for many decades. Today, that tradition continues with the company's latest range of woodburing and multi-fuel stoves. As you would expect from such a heritage, these stoves and robust, practical and efficent, with a construction that combines the very best attributes of iron and steel. The heavy gauge steel firebox is complemented by airtight cast iron doors and durable cast iron fittings and, in the case of multi-fuel models, a rotating grate that can be riddled from outside the stove to improve combustion. Matchless - Matchless gas fires & suurounds. From the very traditional to the ultra modern. Matchless were the first to offer glass-fronted, inset gas fire back in 1997. Paragon - Established in 1986, Paragon Fires manufacture a full range of Gas Fires, Electric Fires and Fireplaces for the UK market. For homes with our without a chimney, for a tradtional or modern feel, Paragon has a range of open-flam and super efficient glass-fronted electric and gas fires that will create the perfect centrepiece for your living room. Katell - Based in County Durham, Specialists in the UK Design and Manufacture of quality Fireplaces including the hugely popular Italia Collection of Electric Suites. Flavel - At Flavel we know how important it is to create a stylish and relaxing living environment. That's why we've developed this collection of affordable gas fires to complement all tastes and lifestyles. Kinder - At Kinder, we know how improtant it is to create a stylish and relaxing living environment. That's why we've developed this collection of premium gas fires and surrounds to complement all tastes and lifestyles. Kinder is crafted by BMF Europe, the fastest growing domestic fire producer in the country with an uneualled reputation for quality and service. Every Kinder branded gas fire is developed and manufactured in Britain at our purpose built, state-of-the-art facility in Stoke-on-Trent. Calfire - CALFIRE are a major Importer and Distributor of Fireside and Heating Products. These products are offered for sale through specialist stores across the UK. Verine - At Verine we now how important it is to create a stylish and relaxing living environment. That's why we've developed this collection of premium gas fires to complement all tatstes and lifestyles. Focus - Focus Fireplaces is company driven by a passion for woodworking within the fireplace industry. Our experienced and highly skilled craftsmen have been making our fireplace designs for over 27 years giving us a market leading reputation for quality and service.